How much of your paycheck do you spend on rent? 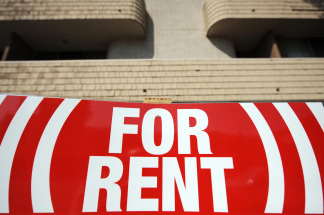 A sign for an apartment to rent is seen in Los Angeles on May 27, 2009. Finding an affordable rental space can be tough in Los Angeles, where 52 percent of residents rent. KPCC business reporter Ben Bergman is working on a new series and would like to know about your experiences with the real estate market in and around Los Angeles. What percentage of your paycheck goes toward rent every month? Has your rent gone up in the past year? Help shape KPCC's coverage by sharing your insights as a renter. We read every response and they all help contribute to KPCC's journalism. Responses are confidential. If you're willing to be public with your responses, though, look for the permission buttons below and click yes.